As a multi-complex post-workout supplement, Tri-Anabol is the latest innovation in the field of doping free anabolic supplements, as opposed to illegal anabolic steroids, stimulating growth processes without side effects. As indicated by the name, Tri-Anabol combines three main driving forces in the most natural way they can be. Tri-Anabol boosts in exorbitant ways anabolic hormones such as insulin, testosterone, HGH and IGF-1, initiates explosively derived nitrogen retention and muscle protein synthesis and rigorously stimulates the immediate and ruthless destruction of muscle destroying catabolism. Thank to this can Tri-Anabol stimulate a muscle anabolic scenario after traning, previously possible only with illegal anabolic steroids. Tri-Anabol delivers the most notorious trigger for maximum muscle protein synthesis and nitrogen retention in the form of BCAA complex compounds and the natural steroid hormone beta-ecdysterone. This anabolic ‘igniter’ break all barriers to your muscle tissue, where they also target the start signals for a hyper anabolic spectacle. The anabolic signals of the "anabolic RACKET booster" are transformed by pure muscle building material of the finest CF & IE Whey Protein Isolate (Hyper-Rapid Absorbing cross-flow and filtrated ionexchanged amino Injection) with its high-quality amino acid profile to increase the muscle cell mass. Through hyperglycaemic carbohydrates such as HCA and Optimizer, ALA, MHCP will the maximal distribution of Anabolic Hormone No.1 – insulin, be ignited, resulting in accumulation of glycogen in your muscle cells and destroying catabolic substances harmful your muscle tissue. 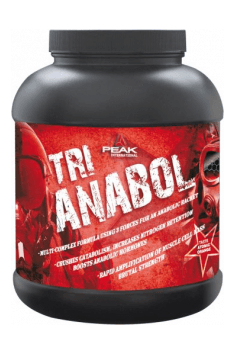 Tri-Anabol contains creatine taurinate, creatine malate, creatine pyruvate and special connections of a simple power generator stimulated by taurine and taurine AKG, Beta Alanine, Citrulline Malate, HMB, norvaline, TMG and MCT supporting your efficiency. With Tri-Anabol you can tackle your next training harder than ever before. Creatine AKG, Creatine Magnesium Chelate, Alkalyn creatine, creatine monohydrate, creatine pyroglutamate, creatine ethyl ester carbonate, Tri-Creatine HMB and D-ribose, and 3-Glycocyamine Guanidinopropionic-Acid (3-GPA) pass through different pathways avoiding all obstacles to your muscle cells to build up and trigger hyper anabolic transfer. In order to generate maximum natural growth, all anabolic hormones have to be in full swing, while the catabolic stress hormones are suppressed. So you can switch quickly after training on the hyper growth mode, Tri-Anabol provides you with the most potent testosterone, growth hormone, or HGH, IGF-1 modulators and cortisol minimizers including ZMA, steroidal saponins (from Tribulus terrestris, Fenugreek and Maca), arginine AKG, Ornithine AKG, ginseng, and glycine. You train harder than the other guys in the studio. What you may not knew, is the fact that you are a victim of free radicals and other pests attacking the organism, which can jeopardize your progress. Tri-Anabol gives you the most powerful antioxidants and regenerators (OPC, EGCG, cysteine, Asorbic Acid, MSM, Cordyceps Extract, Broccoli Sprout Extract) which you need directly after the training to protect yourself from free radicals. After training, it is important to cool down again to give your body the optimal environment for regeneration and growth. Tri-Anabol contains free L-tryptophan, L-Glutamine AKG, N-acetyl L-glutamine, L-alanyl L-glutamine, L-glutamine, and Rhodiola Rosae-extract, which puts you in a state of relaxation. Intensive training will result in the destruction of body fat. The more intense the workout it turns out, the more your fat reserves will shrink, even after training. In order to stimulate the effectiveness of afterburning effects, Tri-Anabol provides you with a complex carnitine (ALCAR including, carnitine tartrate, L-carnitine), and tyrosine, N-acetyl-L-tyrosine and other amplifiers to destroy your body fat permanently. Dissolve 58 g of powder (1 portion) in 250-300 ml of cold water; swallow 2 attached capsules to every portion of a drink. The supplement at the amount of 2 portions should be used directly after ending the intensive training. It will work well both used temporarily after toughest trainings, as well as cyclically after each training for the period of 6-8 weeks. To maximize the effects, it is worth to include a portion of creatine to your supplementation on non-workout days. Acidity regulators (Malic Acid, Citric Acid), Collagen Protein, Natural and Artificial Flavours, Emulgator (Soy Lecithine), Sweetener (Sucralose), Lubricant (Magnesium Stearate), Colorants (Sunset-Yellow and Titan Dioxide). Contains soy products. Ecdysterone is a substance that in the world of bodybuilding passes without much of echo. In reality, however, it is strongly correlated with anabolic hormones and shows a great potential. As it turns out that regular supplementation in appropriate doses can contribute to an increase in lean body mass, increase of muscle strength and endurance, as well as acceleration of metabolism. Ecdysterone significantly improves protein synthesis, characterized by anti-catabolic properties and blocking too high estrogen levels. It is also expected that it may increase erythropoiesis. Dosage: the lack of standards unit consumption. Doses as customarily used in supplementation.